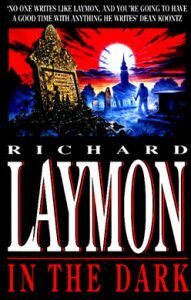 In the Dark is a horror novel written by Richard Laymon. The Central Character is a young woman called Jane Kerry. She is the new head of the Donnerville Public Library and her life starts to change in all sorts of ways when someone leaves an envelope on her chair. Jane never saw who left the envelope. Neither did anyone else, but it has Jane’s name on it so she opens it. There is a fifty-dollar bill inside and a note telling her to ‘Look homeward angel.’ The note is signed MOG (Master of Games) and Jane realizes that the note is probably an allusion to the Thomas Wolfe novel of that name. She checks inside the Library’s copy of the book and finds another envelope. This time it has a hundred-dollar bill in it, along with a further note from MOG. Jane’s next task is harder to complete, but when she finds the third envelope the money has doubled again and Jane becomes hooked on MOG’s little game. As the story progresses, Jane finds herself in increasingly dangerous situations and by the time she wants to stop it is too late, MOG will not allow it. I liked In The Dark; all the way through the book I was trying to figure out who MOG was and how he seemed to be able to know the things he knew, and do the things he did. I formulated a few ideas along the way, but they were all wrong. The other main character in the book is a guy called Brace. On the night that Jayne Receives the first envelope, he is reading in the library and has lost track of time. He doesn’t realize that the library has closed and ends up being in the right place, and at the right time, to help Jayne go looking for the second envelope. MOG’s game is just for Jayne though and he forbids her to accept anymore help from Brace. Jane complies, but nothing can interfere with the intense attraction that Jayne and Brace feel for each other and their romance forms an ongoing subplot throughout the book. In The Dark is a clever book—I think so anyway. Most people will havel been asked the questions before: what would you do for X amount of money? How far would you go? Well in a way these are the questions that MOG is asking Jane and that Jane has to ask herself. I read the paper back copy of the book. It was a little over 500 pages long, the action started on the very first page, when Jane found the envelope, and it just kept on going until the very end.